Having escaped New York and then claimed the assassination fee for their own deaths, Bob and Klaus are hiding out in Oregon, still working on their all-natural pest control. Whilst they had been working on cross-breeding preying insects, they are now exploring the use of genetic engineering, inserting the genes from one species into another. It’s an expensive business and they need investment capital. In steps Blue Sky Investment Partners, a front for DARPA, the funding agency for the US military. They think that Bob and Klaus’ hybrid insects could play a role in fighting terrorism, and conveniently falls outside of the rules relating to biological weapons. Despite assurances that they will stay below the radar, their resurfacing in the DAPRA facilities in LA gets flagged up in the CIA, where a disillusioned agent spots a way to make a fortune by revealing their re-appearance to the Bolivian drug lord who paid for their original assassination, then doing the job himself. What results is a convergence of hired killers and killer insects in LA, along with thousands of religious evangelicals as rumours of the second coming of Christ abound. I thought Pest Control was great fun and was clever with it. 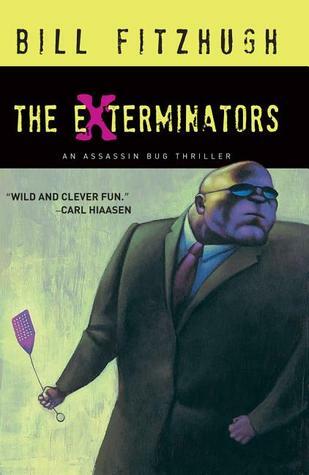 The Exterminators, which is set six years later, has the same style and wit, but the plotting was not quite so spot on, with a couple of loose threads (such as French assassin whose plotline kind of goes nowhere), a couple of nonsensical bits (at least to me, such as the CIA agent’s actions), and a less fluid flow. That said, it is still very clever and well executed in parts -- the threads and explanation around genetic engineering, DARPA, and the fundamental religious right and how it sees the world and tries to manipulate the media were excellent. And Fitzhugh mixes together a nicely drawn set of characters, though Klaus’ assassination skills are somewhat underplayed, as are the roles of Mary and Katy, Bob’s wife and daughter. Overall then, a fun and entertaining read, but definitely not for those with a bug phobia.